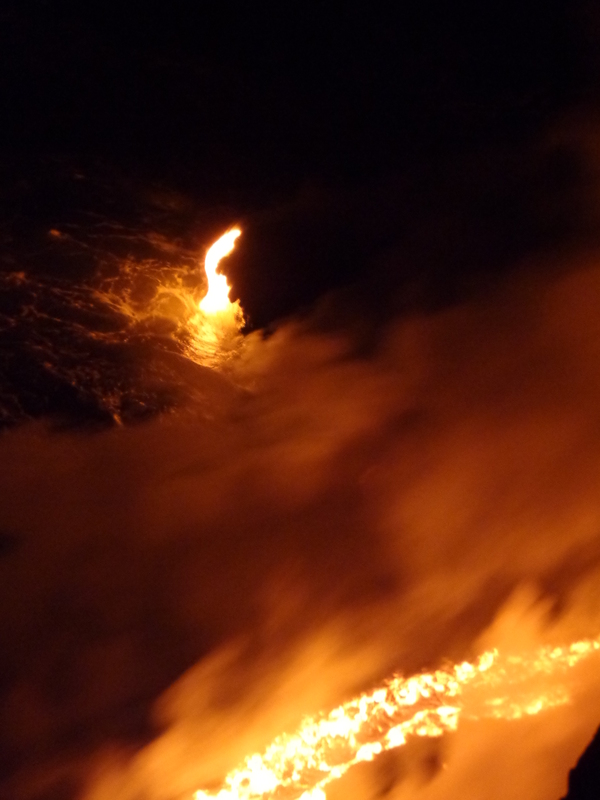 One of many explosions during my master’s vacation… this one on Maui, at Little Beach. No, that’s not him, and no, you can’t try this at home. My master just got back after being in Hawai’i for three weeks, and he’s not the same as when he left. I’m not sure exactly what’s up, but I’ll do my doggone best to explain. 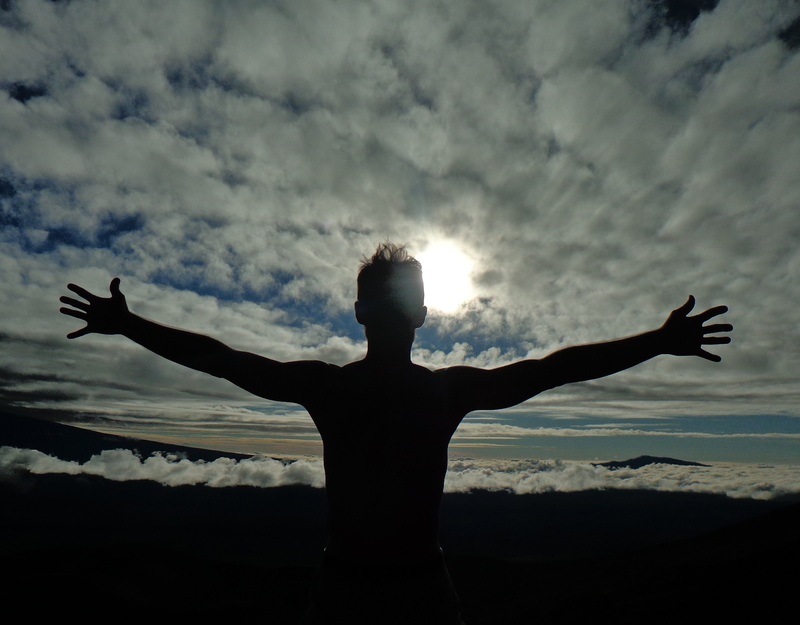 At the summit of Mauna Kea in Hawaii, at 13,600′ in freezing weather… Sometimes, to say he’s “different” is being polite. Now, I know I’m coming from a dog’s point-of-view when I say this, but I think it’s true: My master’s always been a different sort (“touched” I think they call it? ), and so it shouldn’t come as a surprise to anyone, especially me, that he hasn’t uttered a word since he returned. This post is about 1,000 words long, and “a picture is worth a thousand words,” so I thought I’d intersperse a bunch of his vacation pics throughout this entry to break up the rather lengthy explanation that he told me was okay to share with you. So, if you get bored, just scroll through the pics, okay? Thank dogness us canines pick up sign language quickly! I asked him what the deal was with his not-speaking, and he said that he came to awareness about half-way into his trip that the best thing for him to do for the time being was to stop speaking and be quiet. 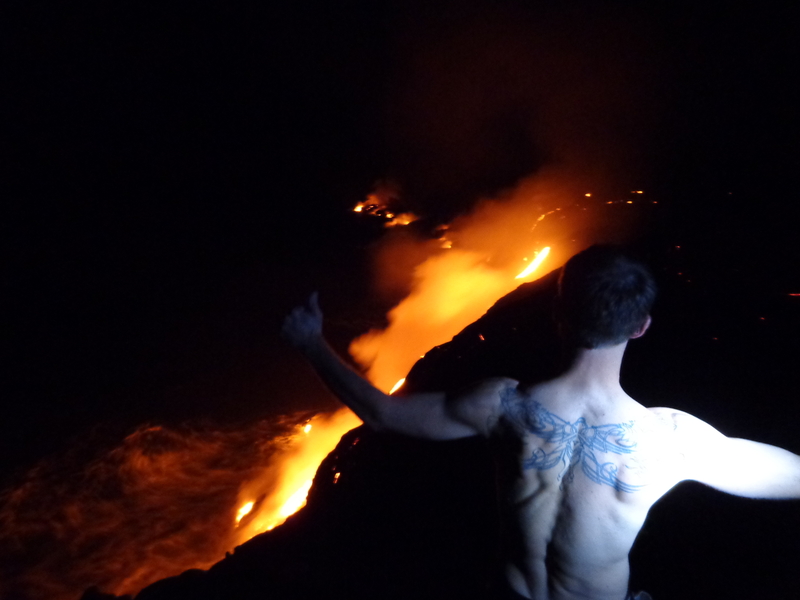 He’s been to Hawai’i before, so I asked him what was so different this time! 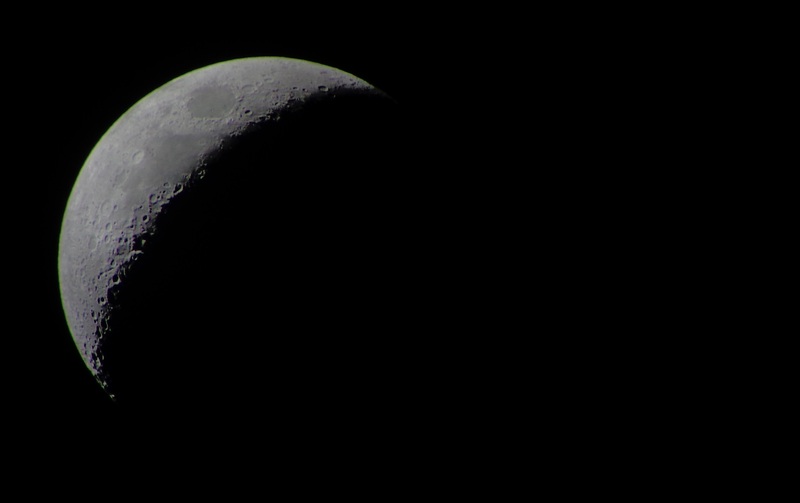 The moon, as seen through telescope at the Mauna Kea Visitor’s Center on the Big Island of Hawaii… makes one feel so small. 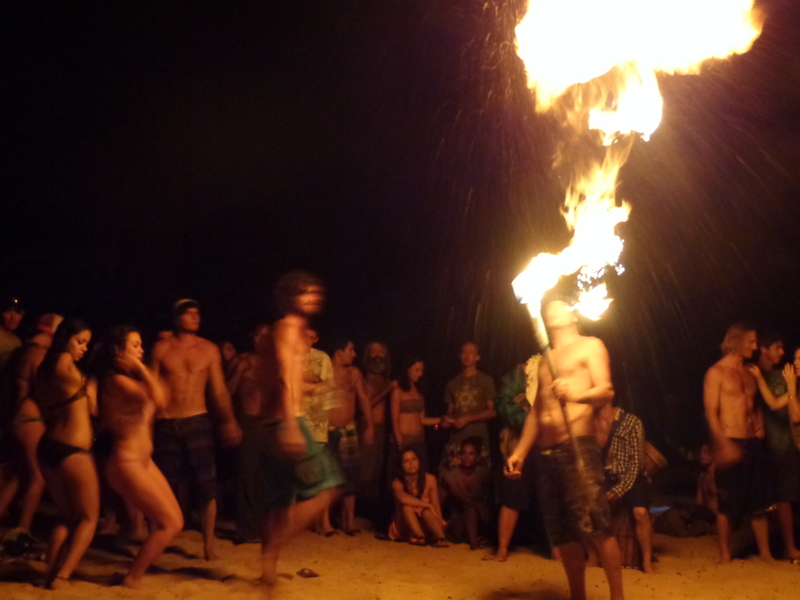 He describes himself as at the intersection of where mind, body, and spirit meet. He claims that being silent is helping him be more peaceful cognitively, physically, and spiritually. Now, I don’t suggest any of my readers try this at home, as it’s a proven fact that my master has a mind like no-one else’s. It honestly didn’t come as a surprise to me that my master would stop speaking. That’s because he has always had a lot of differences (some apparent, some not) when it comes to processing information and using language in the first place. I bet humans with HFA sometimes feel like this observatory probably feels. 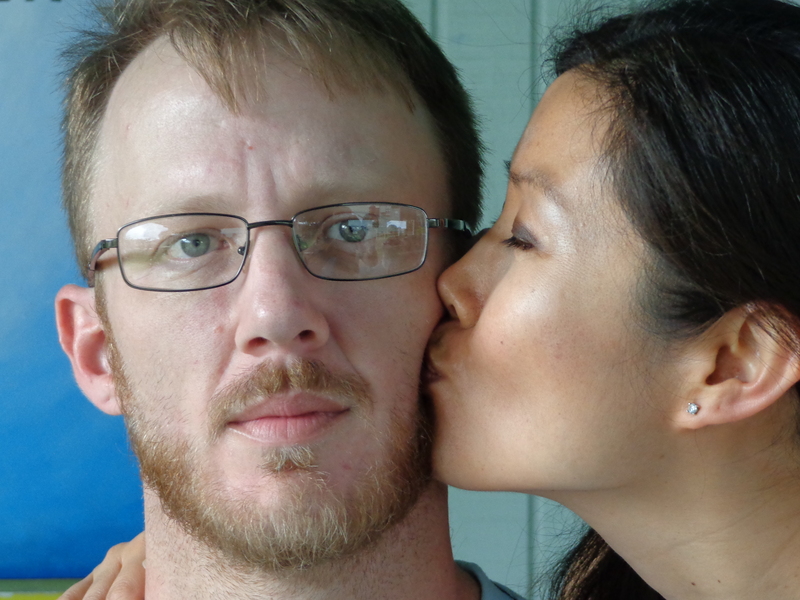 Most of his unique characteristics stem from something he rarely mentions—his high functioning autism (HFA), or, as some humans call it, “Asperger’s Syndrome.” Oddly enough, this is the topic he started with before he told me about Hawai’i. Like sunsets, all people are the same and different simultaneously… now I sound like Kermit the Frog instead of Ada the Dog. Sunset behind Lanai’i. Might take a minute to get there… but worth it. Seen from Hawai’i’s island of Maui, in Lahaina Town. My master reminded me that he once told me, “If you’ve met one person with Asperger’s, Ada, then you’ve met one person with Asperger’s.” I’ve noticed since then that this is a frequently used idiom when talking about HFA. The use of all data streams associated with human communication is distinctly different for those humans who have HFA. 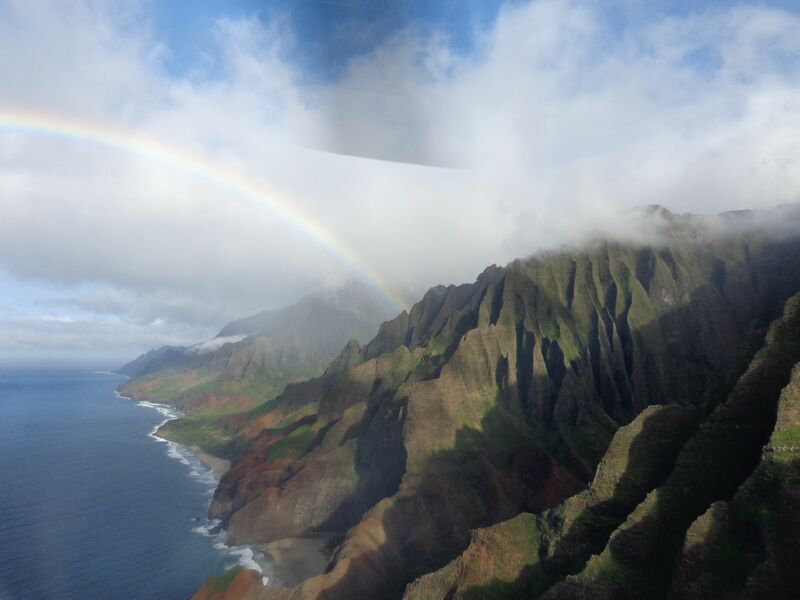 All the Hawaiian islands were made the same way, but they are all very different from each other. Hmm. People often tell my master that they can read his mind because they think they know what his facial expressions mean, but they can’t. Humans who have autism often have a hard time matching inward feelings and outward expressions-so if you want to know what an autist is feeling, you must ask! Don’t assume. Humans with HFA seem to miss cues that neurotypical minds do not, and they pick up on patterns that other humans might never imagine. In short, they process sensory input differently, they seem to miss the visual cues that others pick up on in normal conversation, and they have trouble matching faces with emotions (sometimes, more trouble than others… see this link for more info about that and other HFA characteristics). 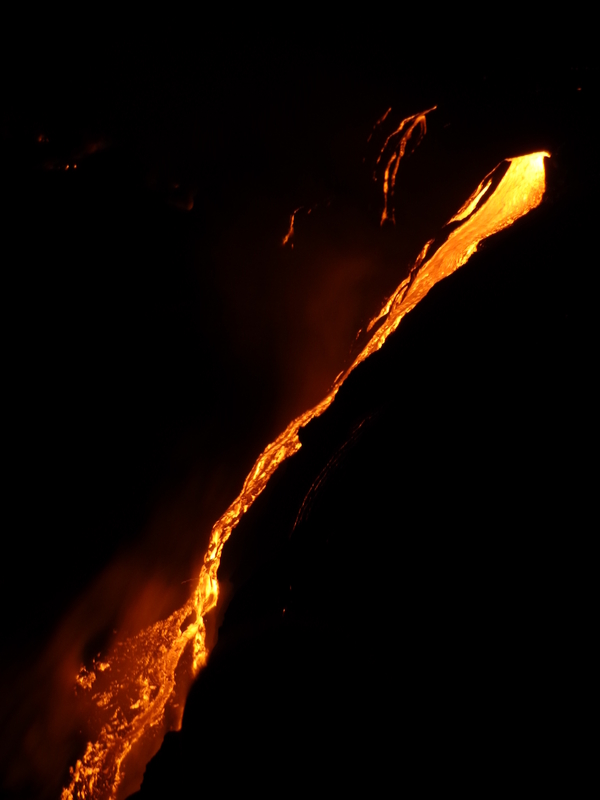 One of my master’s special interests is volcanology. He checks the Hawai’i Volcano Observatory web site nearly every day, and finally got to see the picture he always wanted to see. So, that was the first part—he reminded me what I already know about Asperger’s and how language-driven and pattern-oriented it is. What he didn’t bother reminding me of were the difficult times that he’s been through as a result of knowing how differently he structures his own language, specifically his own speech… but he did tell me that his awareness peaked over the winter break in Hawai’i—and in a positive way. 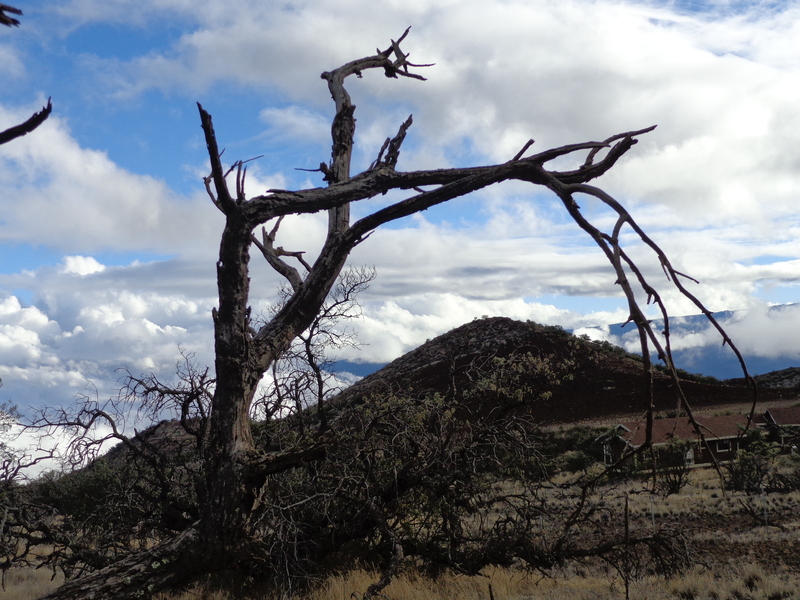 Silverwood on Mauna Kea, framing a cinder cone like a door. He told me that while he was in Hawai’i, he gradually became aware of how language and how speech are used in relationship to power, and it struck him that his autism means that he is also different in this regard. He mentioned that it became crystal clear to him, in an overwhelming way, that language is the very medium of power—and that power itself moves between humans as a result of their communication. Similarly, this is how power moves between the physical world and the spiritual world, and communication is also the chief variable in humans’ social, emotional, and cognitive paradigms. There are natural laws governing power, which is a force not a substance, and they are based in the processes and mechanisms of language. 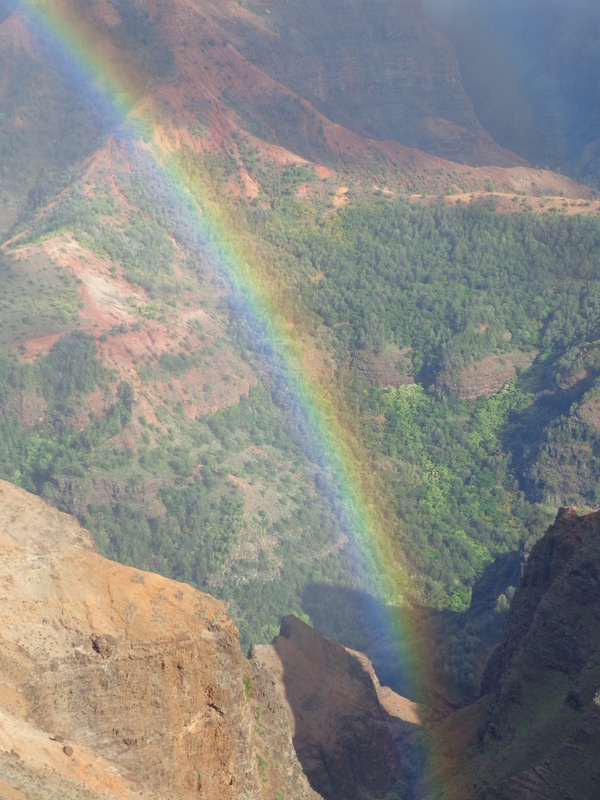 A rainbow shines over the Na Pali Coast of Kauai’i. Then he got academic on me and asked me to consider the generative force traditionally given in many religions to the word “Word”—Logos, in Greek—and he gave me an example from Wikipedia of how John claims Jesus Christ as the Logos, through which and by which all things are made. Of course, there are multiple connections to other religions as well, he added. A big rainbow at the airport leaving Kauai’i. It was a spiritual and humbling experience for my master—that I can tell—and even though he doesn’t have a rationale for exactly why, my master said that the quieter he became, the more at peace and natural he felt in regards to his Asperger’s characteristics… almost like he had been using too many words before, which oddly enough is a trait of those with HFA (along with echolalia, a unique prosody, and being pedantic). 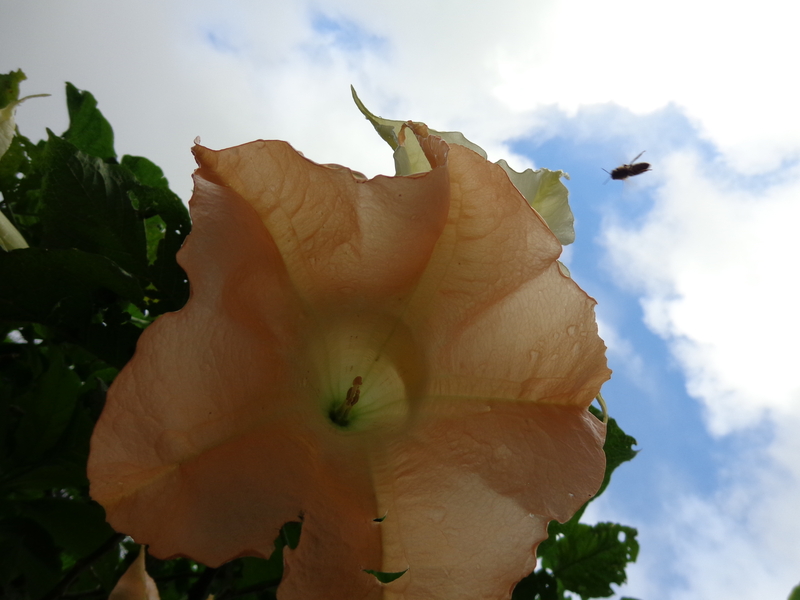 Are you focused on the flower or the bee— Are you focused on the why or the how? No worries. 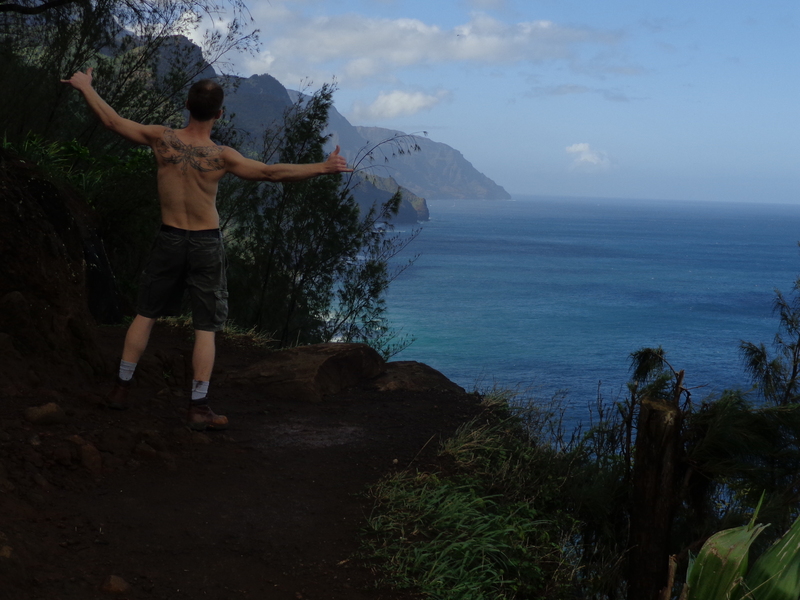 Not even on the Na Pali Coast’s Kalalau Trail. The funny part about this is that I have been telling my master ever since he adopted me to stop asking the question ‘Why?’ and start asking ‘How?’ So, maybe he finally feels convicted to listen to his dog. No worries—whatever works, works. The last thing my master told me was that to force him to speak would no doubt be problematic in many regards. He said that he is asking for me to accommodate him by not requiring him to speak. Read: I’m supposed to be mindful of instructions with just hand signals, notes, and whistles now… oh, and that annoying beep from my collar. Tranquility: Where we all want to live, but few of us do. Mahalos to you, Kalapana! The earth being formed, at the edge of Hawai’i’s Big Island near the Hawai’i Volcanoes National Park– but more importantly, near Kalapana. …and here’s a playlist where you can check out my videos on youtube. All photos (c) Ada Mae Compton, 2013. Give credit where credit is due if you lift these pics or my master’s ink design. Oh, and you can click on any pic to enlarge it. I always try to upload high resolution pics, so it might take a minute for them to load. Gallery | This entry was posted in Popular Stuff, Powerful Stuff, Silence and tagged 360, ada mae compton, adult, art, aspergers, autism, autistic, big island, blog, characteristics, compton, conditions, creative writing, current, degree, destinations, difficult, earth, environment, events, funny dog, hawai'i, hfa, high functioning autism, humor, impaired, january, jeremiah gee, kauai, kauai'i, lava, life, living, love, man who doesn't speak, man who stopped speaking, maui, nature, new, news, not speaking, now, ocean entry, personal, pets, photo, photo essay, photography, pics, politics, quiet, quit, rainbows, recent, reflection, reflective writing, religion, silence, speak, speaking, speech, stop, three legged dog, touching, tourism, tourists, travel, US, video, waimea canyon, waterfall, writing, years. Bookmark the permalink. Ada Mae, thank you for sharing. I think this is a tremendously powerful story that many of us, with or without HFA, could learn from. There is a lot to be said and learned from just being silent. One of my favorite person in my life was a great example of this. Hope you get to visit this summer; I have a new little buddy you would love to play with! I’m sure I would, brO, I’m sure I would! Wondered where you’d gone to. Missed your blogs. You’ve made me curious: please ask – does he find an experiential difference between words/language heard and words/language read? Hi Ada Mae I wondered how you were doing and your master too. Loved reading about your master’s new journey on all accounts. You sure are happy when he comes home and I certainly can see why! I hope he catches up on his blog writing now that he’s back. I missed reading them.